No matter your skill level with a bow it’s important to invest in a high quality one. Not only will this improve your skill but also your confidence. Practicing with a low quality bow will only frustrate you and make it harder to be consistent with your shooting. The SAS Rage Compound Bow is a wonderfully made bow that will help you develop skill, confidence, and promote innate talent in any archer. This high quality bow is very durable – perfect for not only shooting at the range but also for a great hunting bow. The max FPS of 270 is plenty fast to accomplish most shooting feats you wish to undertake. 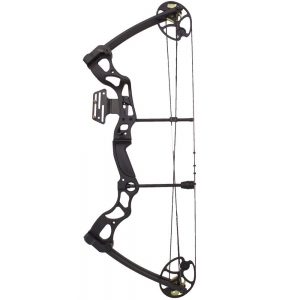 The SAS Rage Compound Bow is 35″ from axle to axle. The archer using the bow can adjust the draw length four inches from 26″ to 30″. It’s also possible to adjust the draw weight by 15 pounds from 55 to 70. Because of these ranges it’s possible to easily customize this bow based on your strength, age, and ability. This bow can grow with you as you get bigger and as you get stronger – an important factor in being able to increase the draw weight of the bow. The bow weighs a light 4.4 pounds – perfect for someone not as strong or for hauling in and out of the woods on a hunting trip. The pros of this SAS Rage bow are many, including the ease at which the archer can adjust the draw weight and length. 70 pounds of draw weight is a lot and it’s nice that this bow can be used by even a stronger and more professional archer. There’s no reason that you’d have to buy multiple bows as this one can adjust so easily. There are some cons to this SAS Rage bow. One issue is that there is no quiver that comes with it, making that accessory an added expense that a lot of archers may no be prepared to pay for. The strings that come on the bow may not be ready to shoot immediately and may require waxing. Although this is an easy issue to correct it can be really frustrating when you open the box and want to immediately shoot the bow and instead have to take the time to make sure that it is ready to shoot. The included accessories aren’t mounted on the bow, so if you have concerns about how to attach them you may have to consult a pro to get everything done correctly. All in all, this bow has received mostly positive press online from customers. There are a few reports of the screws being a little loose in the bow when it was received. Although this is easy to take care of and a problem that can happen with all bows, it’s still a source of frustration. Other archers have stated that after a small time investment spent fine tuning the bow they were able to quickly and easily shoot with great accuracy. Finding a bow that you can immediately shoot straight out of the box without any adjustments is going to be very rare. The time spent ensuring that the box is in the best firing condition before you shoot it is something that everyone should understand will be part of the deal when buying a new bow. As far as the problems some people have with accessories not being attached – either ask a pro for help, some friends, or look online for information. This bow seems to be a wonderful one for archers of most level. It has the potential of growing with the archer for years to come and seems to be a wonderful investment in your hobby.